The face of each has been moulded in a rose motif, while the back is perfectly flat. 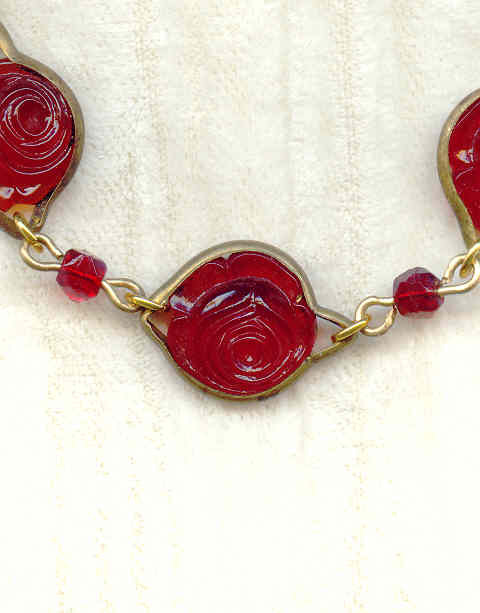 I've wired these with some 4mm hand cut beads and a pair of prong-set crystal discs, all in the same deep red colour. The cabochons and beads are almost certainly Czech, while the prong-set channels are most likely contemporary Swarovski production. 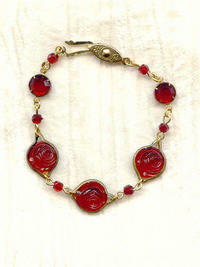 The bracelet is about 7-1/4 inches long, and closes with a gold plate fish hook clasp. It's another gorgeous bracelet from SPARKLE PLENTY. These NEAT rose pink channel sets each measure about one inch along their longest sides. The large glass diamond-shaped beads are a tomatoe-y red, which might seem an unlikely colour on which to paint bright fuchsia and purple dahlias.